If you know someone who loves to fish, I have just the tutorial for you! The fishing lure in the photo is entirely edible... even the hooks!! This edible fishing lure would be the perfect decoration on a cake or cupcakes made for a fisherman's birthday or even a groom's cake! 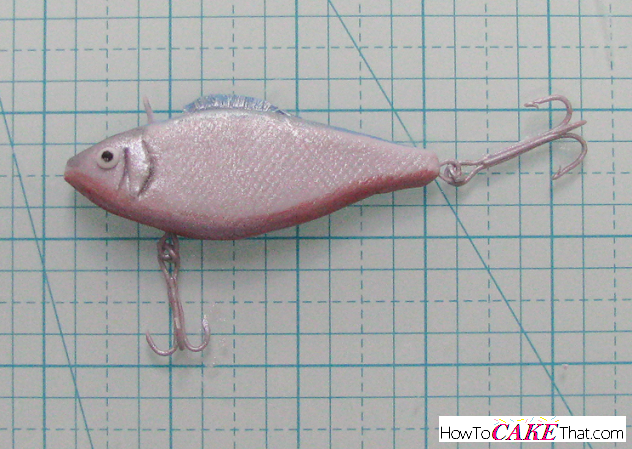 Learn how to make this fishing lure yourself in this easy to follow tutorial! Enjoy! For this tutorial you will need a hand-crank clay extruder gun. It is very important that it is the hand-crank style and not the push in plunger style. Gum paste will need to pass through a tiny disk and it will be nearly impossible without the crank. 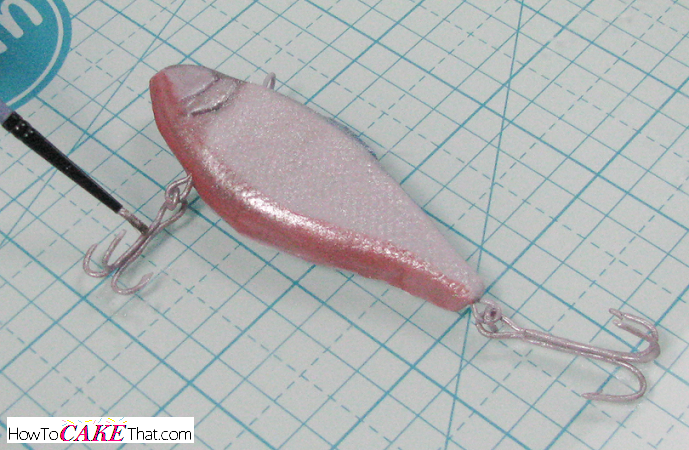 For the first part of this tutorial we will be making the edible fishing hooks that will attach to the lure. 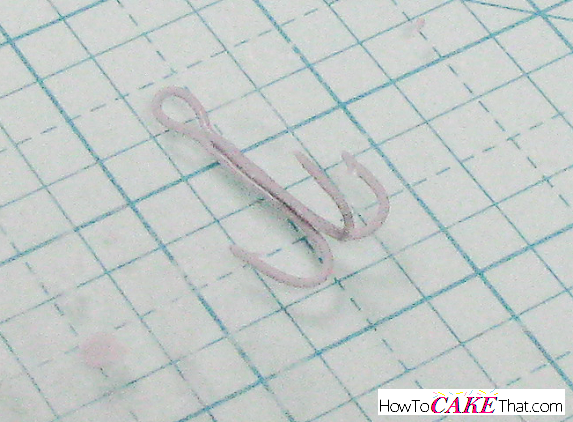 These hooks will be very delicate and will need to be made from 100% gum paste to make them as sturdy as possible. Color a small amount of gum paste a light gray color using gel food coloring. 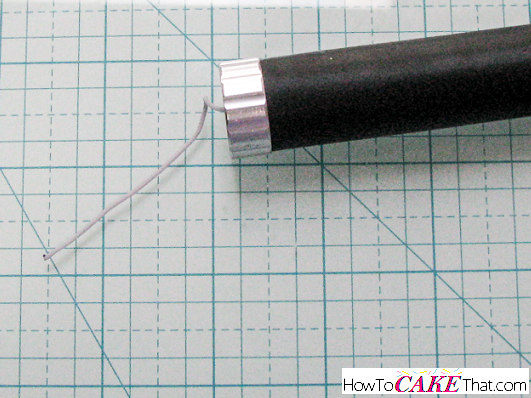 Fit the extruder gun with a tiny round disk and place the gray gum paste in the extruder gun. 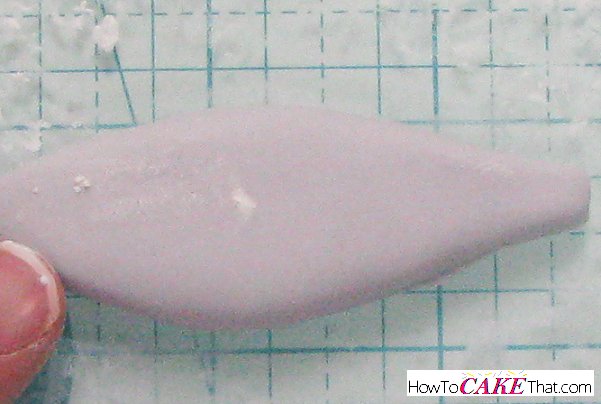 Press the gum paste through the disk to create a good size piece of gum paste string. To begin forming the three pronged hook, cut one long piece of string. Fold the long string in half, leaving a small loop at the top. 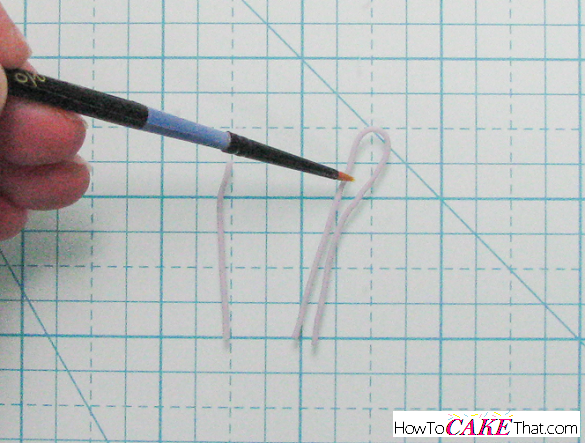 Ensure there is enough string to curl each end up into a hook shape. Lightly brush a little water in between the two dangling strings (in the middle area) where the strings will be touching. Press the middle of the strings together to glue them together. Next, using a razor blade or sharp knife, cut sharp points on the ends of the hooks. If you'd like, carefully cut barbs onto the hooks to make them look more realistic. 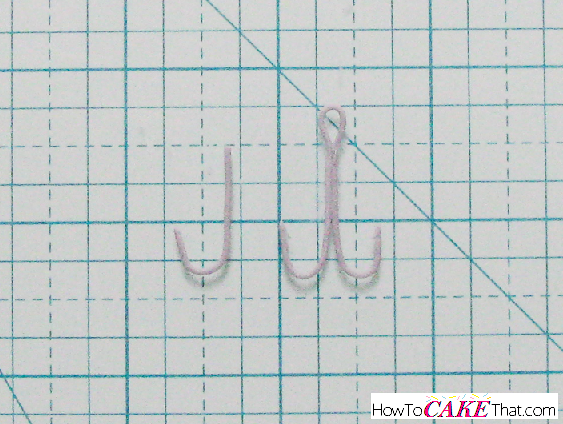 Next, cut a smaller string and curl into a hook the same size as the other two hooks - minus the loop. Cut a sharp end onto the hook just like the other two hooks. Repeat above steps to make another set of hooks. 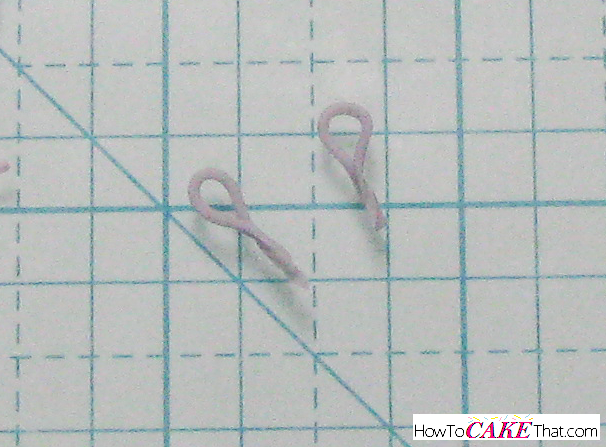 Next, make three tiny loops using the gray gum paste string. To make the loops, fold the strings in half and pinch the string ends together. Do not trim the string ends off - they will be needed to attach the loops to the lure. Allow hooks and loops to fully dry. While the hooks are drying, it's time to make the lure's fish body. Blend a mixture of 50% fondant and 50% gum paste. 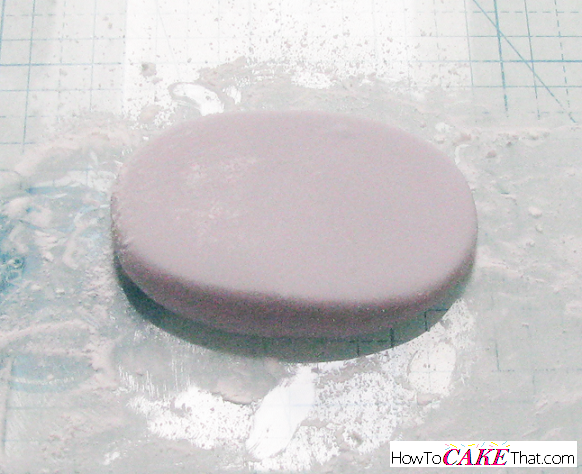 Color the fondant mixture a light gray and place onto a surface dusted with cornstarch. 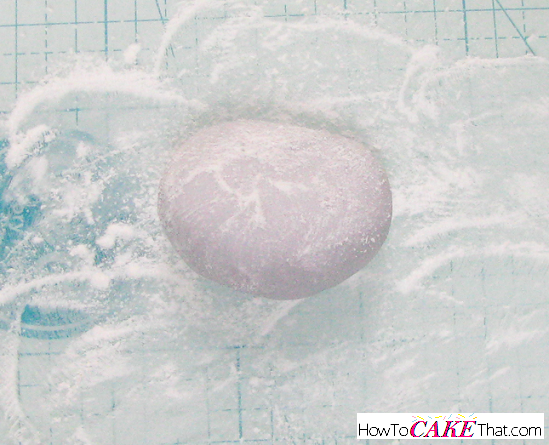 Dust the surface of the fondant with cornstarch as well. 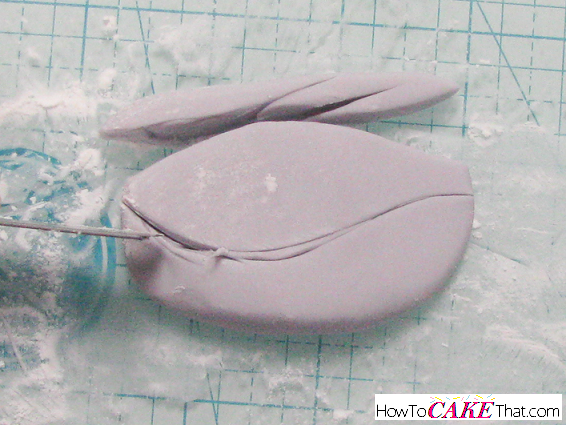 Use a fondant smoother to press down onto the fondant to flatten it into a patty. On the end where the lure's tail will be, slightly flatten it a little more to make the tail end a little thinner. 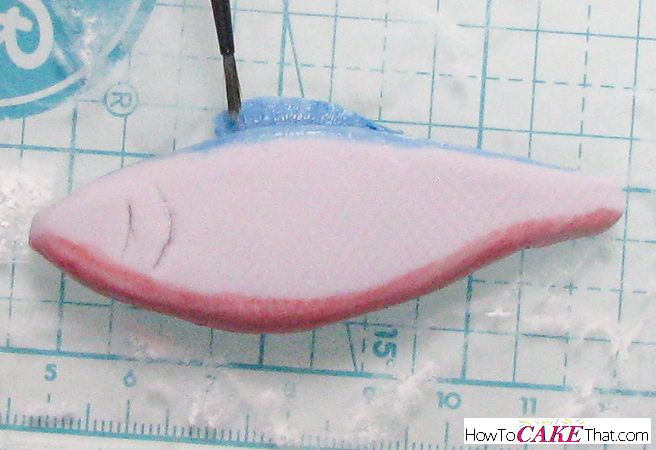 Using a razor blade, lightly sketch the lure's body shape onto the surface of the fondant. 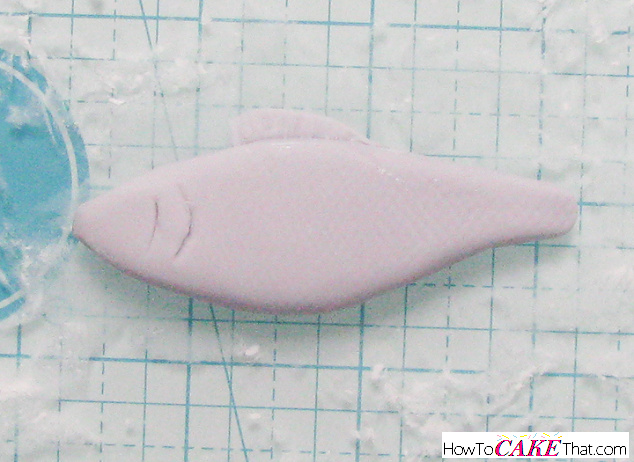 Once you are happy with its shape, cut out the fondant lure. Rub your finger all the way around the edge of the lure to smooth down the sharp edges. To give your lure some texture, place a piece of small fabric netting over the lure's body. 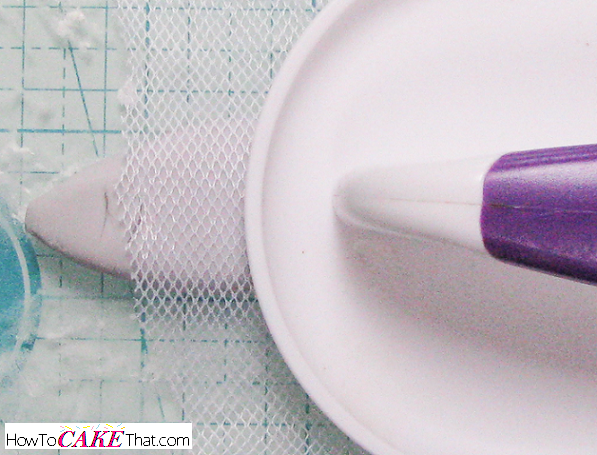 Press the netting into the side of the lure with a fondant smoother. 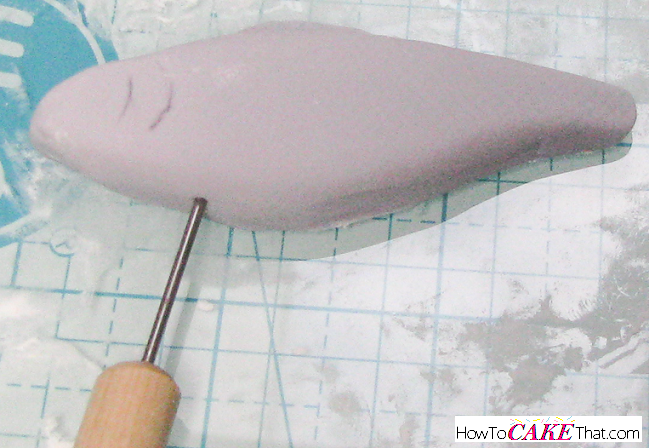 Next, shape a small piece of gray fondant into a top fin and attach it to the top of the lure using a tiny bit of water. Using a shaping tool, carve the gills. Remember the loops we made earlier? Two of them will be used to attach the hooks to the lure's body. The remaining loop will be where the fishing line would attach to the lure. To make the loops securely attach to the lure, poke three holes where the loops will need to go - one on the belly of the lure, one on the end of the tail, and one on the top of the lure just before the top fin. Now it's time to add some color to your lure. To do this, create a watercolor-like paint by blending 150 proof (or higher) alcohol with gel food colors. Paint colors directly onto the lure. For this tutorial I am using Wilton's Royal Blue gel color and Wilton's Red Red. I also enhanced the gill area and top of the head using a tiny bit of Wilton's Black. Allow paint to fully dry. While the lure is drying, it's time to assemble the hooks. 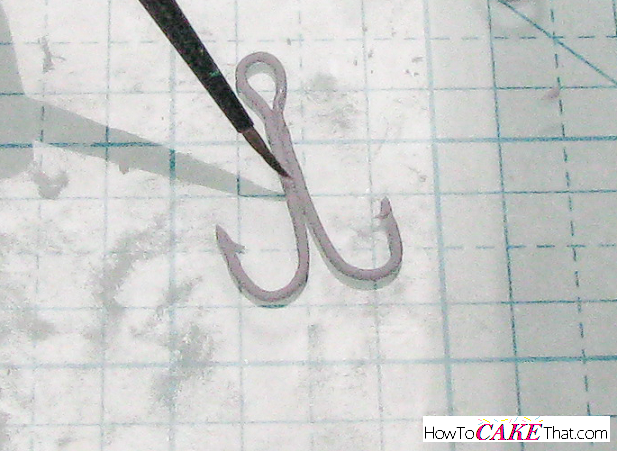 To attach the third hook onto the double hook, lightly brush the center of the hook with a little water to dampen it. Gently place the third hook on the center of the double hook. 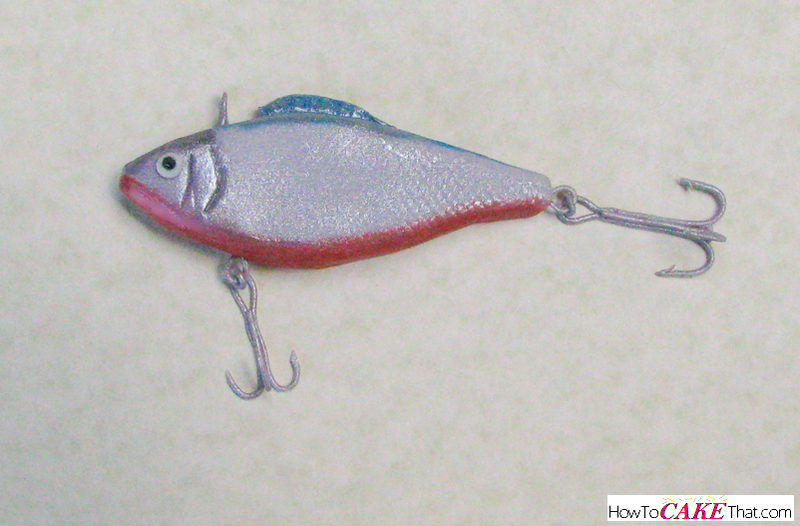 Make sure the third hook is sitting upright to give your triple hook a realistic 3D appearance. Allow hooks to fully dry. Once all pieces are dry, it's time to give everything a metallic finish. For this tutorial I will be using CK Products NU Silver dust. To give the fish lure's body a metallic finish, generously dust the lure with dry dust. Next, attach the three loops to the lure by lightly dampening the string ends with a little water and inserting them into the holes in the lure. If the strings are too long or too thick, trim them down with a razor or sharp knife. To make the hooks look like they are attached to the lure, slide the loop end of the hook under a loop that is attached to the lure. 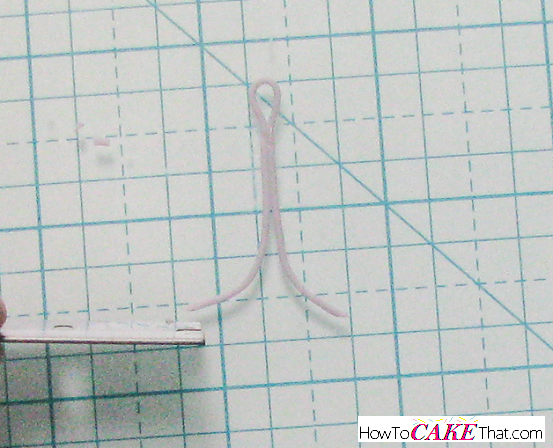 Trim a tiny piece of gum paste or fondant string and drape it over both loops. The hooks will not actually be attached to the lure - it will just appear that way. To give the loops and hooks a realistic metallic finish, mix a little silver dust with 150 proof (or higher) alcohol to create a paint. Carefully paint the silver dust onto the hooks and loops. Allow to fully dry. Now to add the final touch. Our little lure needs an eye. To make an eye, press a tiny ball of fondant into a flat round disk. 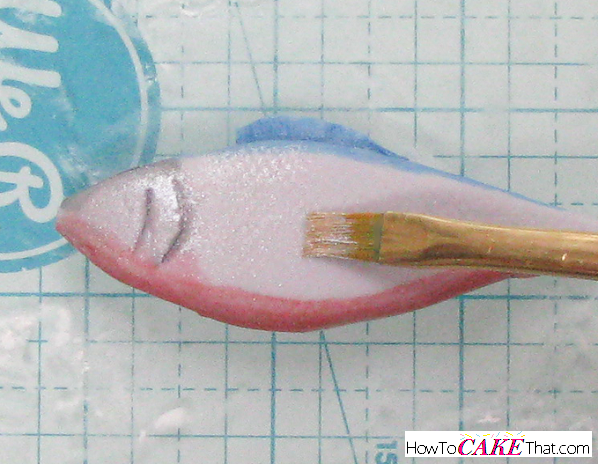 Glue the fondant eye onto the lure's face by lightly brushing a little water onto the back of the eye. To make the pupil, either paint one on by mixing alcohol and black gel color or attach a tiny round black fondant disk to the center of the eye. 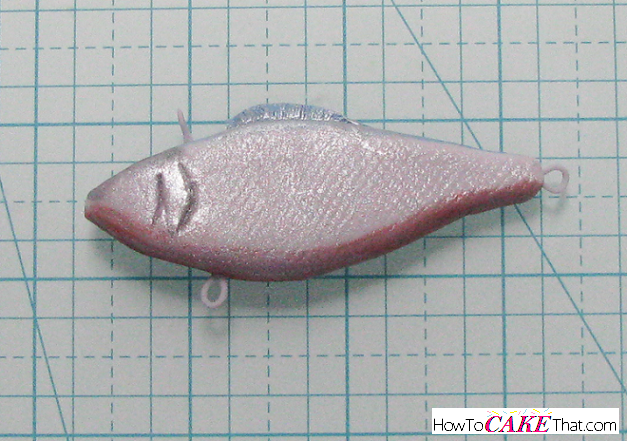 And that's how you make this realistic, completely edible fondant fishing lure! I hope you have enjoyed this tutorial! God bless!